Ashampoo Internet Accelerator will boost the speed of your internet connection by changing Windows default parameters. Many windows settings work in harmony in order to get the best out of an available internet connection. Unfortunately, the factory design of these settings means that they are often not optimised for a particular connection type, or they are adjusted by a newly installed software product unasked. The consequences are plain to see: the computer can`t get the best out of your internet connection. As a user, this means you have to wait longer until web pages have loaded in your browser or until internet downloads are finished. A slow internet connection costs time and gets on your nerves. For this reason, taking the time to optimise the settings is almost considered a must - particularly since an optimisation in terms of speed doesn't come with any additional cost, neither for a hardware extension nor for the software, as the Ashampoo Internet Accelerator 2 can be used completely free of charge. · Any computer that runs on one of the above operating systems at a reasonable speed. · Graphic adapter: min. resolution 800 x 600 and 16-bit High Color. · Required Software: Microsoft Internet Explorer 5.0 or later. · Other: Full administrative rights are required to install and use the program. You cannot download any crack or serial number for Ashampoo Internet Accelerator Free on this page. Every software that you are able to download on our site is legal. There is no crack, serial number, hack or activation key for Ashampoo Internet Accelerator Free present here. Our collection also doesn't contain any keygens, because keygen programs are being used in illegal ways which we do not support. All software that you can find here is freely downloadable and legal. Ashampoo Internet Accelerator Free installation package is prepared to be downloaded from our fast download servers. It is checked for possible viruses and is proven to be 100% clean and safe. Various leading antiviruses have been used to test Ashampoo Internet Accelerator Free, if it contains any viruses. No infections have been found and downloading Ashampoo Internet Accelerator Free is completelly problem free because of that reason. Our experts on malware detection tested Ashampoo Internet Accelerator Free with various spyware and malware detection programs, including fyxm.net custom malware and spyware detection, and absolutelly no malware or spyware was found in Ashampoo Internet Accelerator Free. All software that you can find on our servers, including Ashampoo Internet Accelerator Free, is either freeware, shareware or open-source, some of the software packages are demo, trial or patch versions and if possible (public domain licence), we also host official full versions of software. Because we want to be one of the fastest download sites on the web, we host all the software including Ashampoo Internet Accelerator Free on our servers. You cannot find here any torrents or download links that would lead you to dangerous sites. 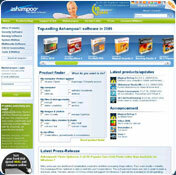 Rate Ashampoo Internet Accelerator Free 2.11!